Ongoing spiritual growth provides another way to create balance in our Christian life. St. John's offers opportunities for all to continue to learn and grow in their faith. We invite you to learn about the many spiritual growth opportunities for youth and adults at St. John's, come and join us! Nursery Care – Every Sunday we provide nursery care in our Little Blessings Nursery from 7:45 a.m. – 12:15 p.m. Care is provided by our experienced nursery staff for children under the age of four. Godly Play – During our Sunday School hour, our 3 year old – Kindergarten students are in the Godly Play program. Godly Play is an interactive, Montessori based program that allows our youngest students to learn the stories of the Bible through hands-on experience. Our instructor has had formal training and over 15 years of experience with this program. At the end of their Kindergarten year, the children graduate with their first Bible! 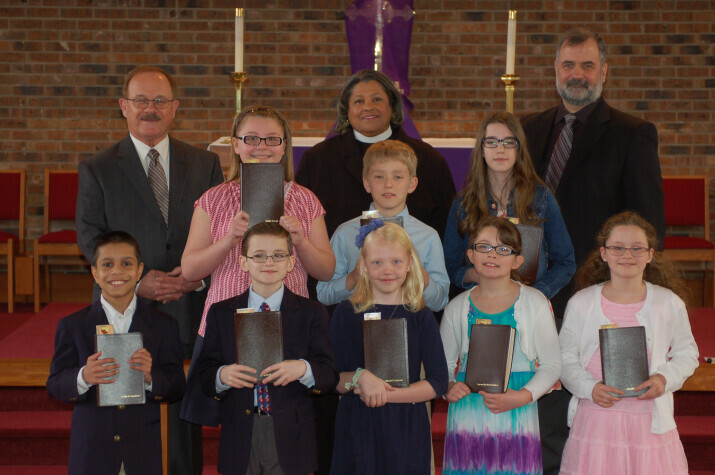 First through Fifth Grade – Our First through Fifth grade students follow the Gospel Light curriculum. This curriculum is designed to help children discover and follow Jesus. Jr. High Programs – On Sunday mornings our Junior High School Youth Ministers, Michelle and Steve Herner, lead a program that is meant to draw kids toward Christ, toward each other, and toward the church. This emphasis is complemented by laughter, games and fun activities that bond the kids together as they grow in Christ. High School Programs- The Senior High ministry, for students in Grades 9 – 12, is led by Michelle Zegarski. This program consists of opportunities for conversation about life and faith, and includes games, movies, events and service opportunities.